Every new MMORPG gets to the point where they can begin sharing the current version of the persistent level with their community. Ship of Heroes is at that point right now. The map above is the first viewable version of the map of Apotheosis City. While every part of the city has not be allocated to a zone yet, it is clear that there will be about a dozen zones in the first playable level. Apotheosis City is one of the most important cities on the FHS Justice and benefits from its proximity to the engineering level. It was one of the first 8 levels built of the Justice, while still in Earth's orbit and is the one of the most Earth-like environments, including a body of water, green spaces with grass, trees, and vegetation, and a holographic Earth-like sky, which will offer night and day and eventually changes in season to accommodate its human residents. Of course, many engineers live in Apotheosis City – it also has a special problem with Prometheans who inhabit unmapped access ways under and through the city and the Ship at large. The Apotheosis City level is large – larger than the starting maps in City of Heroes and probably also SWTOR, for any of the first four game-entry worlds. It is a large open world, not unbounded but large by modern game standards. The devs have managed to avoid the dated look of endless prairie, desert, or similar-looking Soviet architecture that became common 10 years ago. Comparing to modern games, Apotheosis City is about the same size as the map of Fornite’s Battle Royale, for example, but with much more urban space. The FHS Justice uses a modular in construction with 20 levels (and sublevels) along with helm and engine levels, each level is .75 miles in diameter, like Apotheosis City but very different in function and appearance. The ship is 20.4 miles long. As the game grows, each level will become playable area for missions, careers, harvesting, and possible bases but there is a literal universe of potential expansion with alien and human ships and other worlds. This map will become a tool in-game, as well as providing fans with the ability to zoom in and place some of the scenes they already become familiar with – such as the Arch, the Science Park, Heroic Plaza and the Warehouse District. The maps were created by the environmental art team at Ship of Heroes and exactly replicate the in-game maps from the beginning of 2018, which was used for the successful combat Alpha which was just completed. The map will be periodically updated, and the next update will likely be in April of May. Now that the first combat Alpha is over, the devs have a backlog of improvements to install into the game, and some of these will affect the map. The devs at Ship of Heroes know that it can take an Indie team a long time to make a playable space really immersive – it’s all in the details – so they have been giving regular updates on the persistent level of Ship of Heroes for 15 months, and still have the rest of 2018 to complete the planned portion of the map before Beta begins. The devs plan their newsletters, videos, livestreams and Alpha activities to showcase sustained progress in creating the new world aboard the FHS Justice. 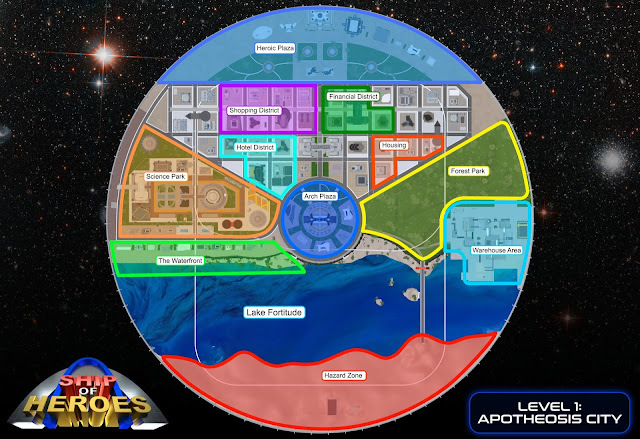 The Devs of Ship of Heroes will be describing the zones in greater detail in future updates - for now players can speculate on the roles that each zone will play in Apotheosis City, the base level for launch where the adventure begins in Ship of Heroes.